Stairway to Heaven is one of my favorite beginner guitar lessons, it has a great melody and solo. Actually, I first played this song on the trumpet in the elementary school band (just in case you wanted to know 🙂 ). You’ll notice that it starts off really slow and gentle, and progressively moves into faster hard rock, building adrenaline all the way through, which is really exhilarating when playing in a live band with other musicians. 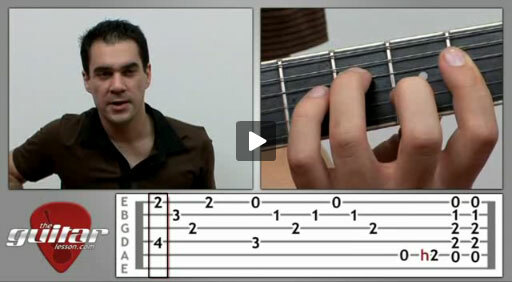 This video guitar lesson will teach you how to play the guitar version obviously, which is not that difficult if you’ve come to grips with bar chords already. I teach it using the plectrum, but you can fingerpick the song as well. This is a really long song and lesson, which beginners will find very tiring, since the song requires many bar chords and chord changes. You’ll be learning this great piece one step at a time. The intro starts off by playing a couple of arpeggios on bar chords, where the opening notes are on non-adjacent strings. This is often used in guitar music, it adds depth and color. Afterwards, we’ll be learning more chords and arpeggios, and than some more chords. All in all, this is a really useful lesson covering a great song. We’ll be working our way through the entire song, giving you a chance to practice chords and arpeggios. Download the tabs and have them handy when you practice without the video lesson, since the song is really long and easy to get lost in. Stairway to Heaven was released by Led Zeppelin in 1971 on their fourth album, titled Led Zeppelin IV. Stairway to Heaven was composed by guitarist Jimmy Page and vocalist Robert Plant. The music was composed first, and the lyrics were written for the music. Stairway to Heaven is immensely popular around the world. It is estimated that the song had been broadcast on many radio stations over three million times altogether, which equals more than 45 years of back-to-back running. It is also one of the best-selling songs bought on sheet music, with an average of 15,000 copies yearly. Sorry, but you've reached a premium content area. The download of the Stairway to Heaven tablature file is only available to premium members. Sorry, the same goes for the backing track. To download the backing track to Stairway to Heaven, please log in and revisit this page.